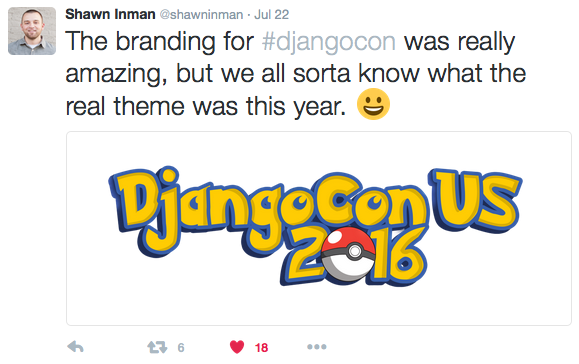 DjangoCon wrapped about a week ago. 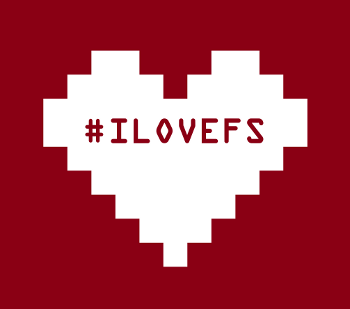 As an organizer, attendee, speaker, and community member, I wanted to take a few moments to share some of the things I loved about this year’s event. As an organizer, I worked on bringing our docs up to speed this year so that the tasks of session chairing and session running were more clear for volunteers. I also had the privilege of emceeing thirteen terrific sessions! “Readability Counts” by Trey Hunner. Description here. Follow Trey on Twitter. I’ll add the video link when it’s published! 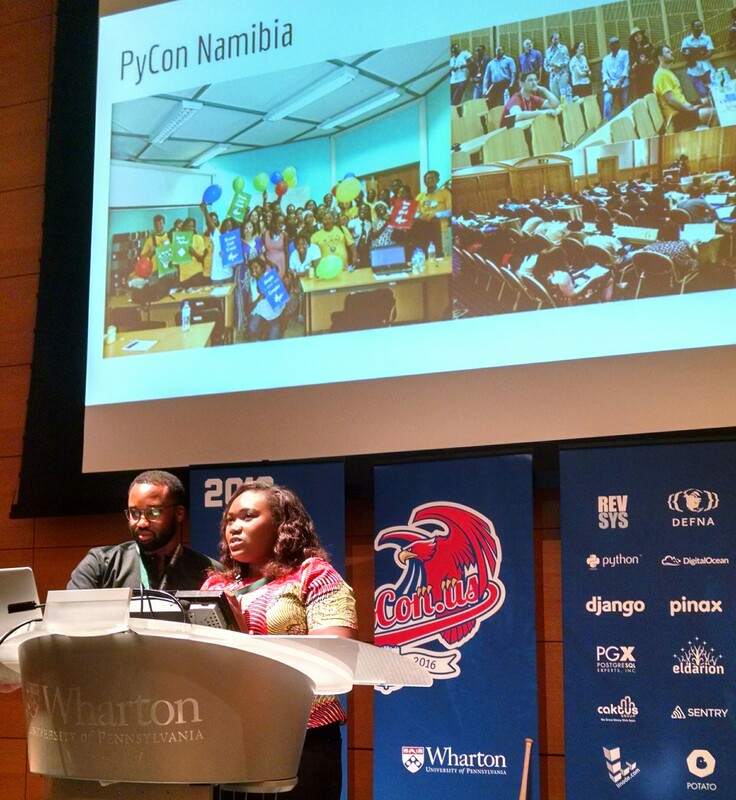 “The impact of women learning to code in developing countries: benefits and challenges” by Aisha Bello and Ibrahim Diop. Description here. Follow Aisha and Ibrahim on Twitter. I’ll add the video link when it’s published! 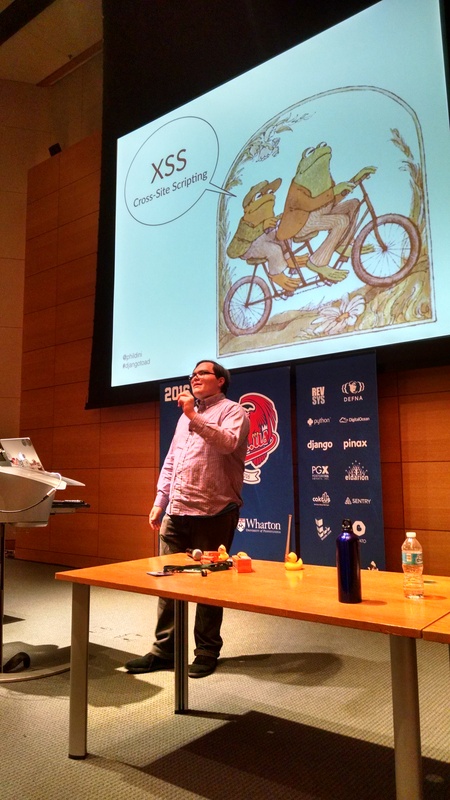 “Frog and Toad Learn About Django Security” by Philip James. Read the description here. Follow Philip on Twitter. 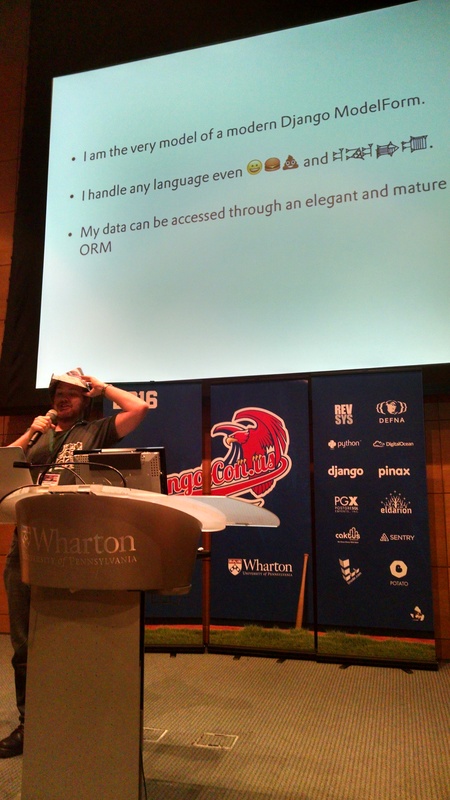 Video “Safe-ish by Default” from DjangoCon Europe here. “Just Enough Typography” by Joni Trythall. Description here. Follow Joni on Twitter. Here are her Top 10 Typography Tips. 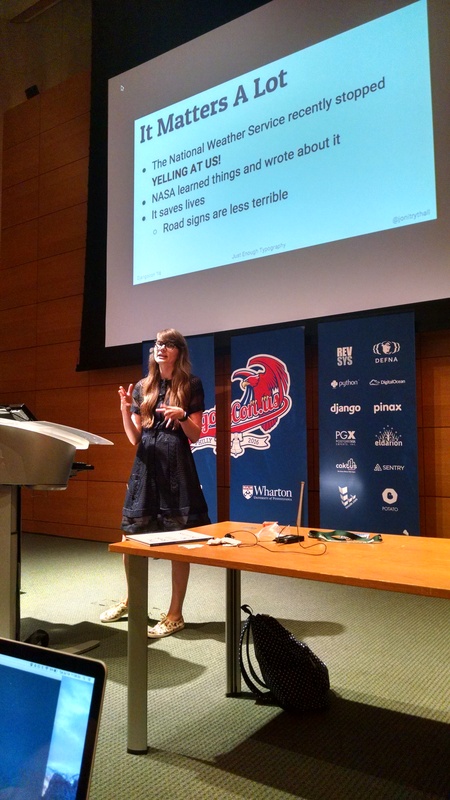 Becca, one of the organizers of Django Girls Philly, invited me to speak at their opening. I shared a shortened version of my “Bake the Cookies, Wear the Dress” talk which was originally given at ELA Conf last November and requested for OSCON and PyCon this year. 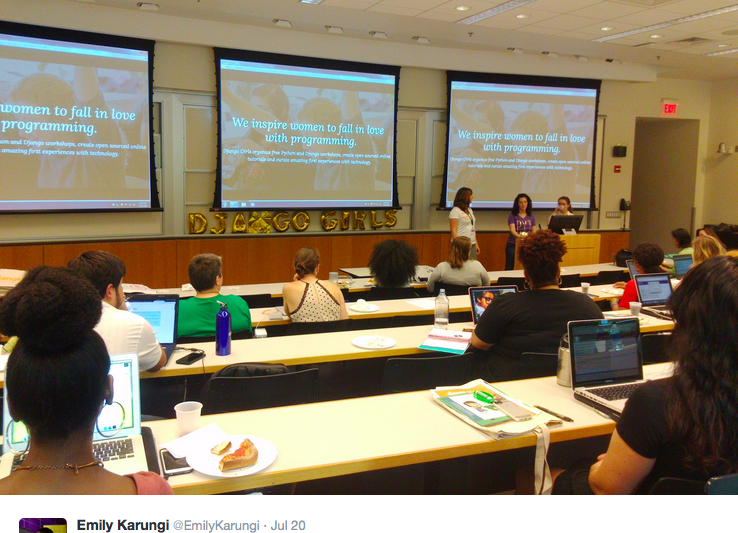 It emerged out of remarks I made at the first Django Girls Atlanta workshop. Briefly, I share the story of how a major setback prompted me to get serious about learning to code, and how I experienced tragedy but chose to learn from it, move on, and grow into the developer I am today. Organizers Becca, Clare, and Laura let me know that the women in attendance enjoyed the talk and were pumped to start coding after hearing from me and the others who kicked off the session! I offered a few suggestions, from staying in touch with the community on Twitter to digging in with the official Django tutorial, Al Sweigart’s Automate the Boring Stuff with Python, and Michael Kennedy‘s (of Talk Python) “Python Jumpstart By Building 10 Apps“. 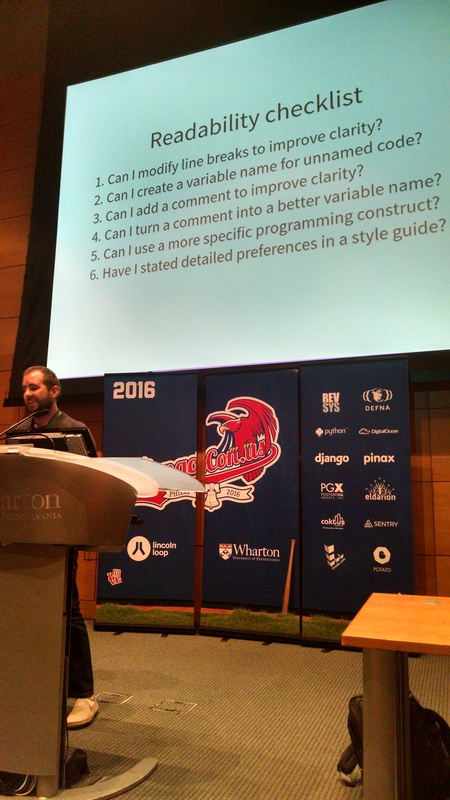 I also emphasized the importance of continuing to use git and track work with GitHub. If you need a refresher on how to do that, I recommend Daniele’s “Don’t Be Afraid to Commit” workshop. Finally, since folks loved Terian’s lightning talk about bots, I recommended her build-a-bot tutorial online. Here are the slides from my closing talk, with resources. To the tune of “I Am the Very Model of a Modern Major-General”, of course! Miss it in person? Here’s the recording! 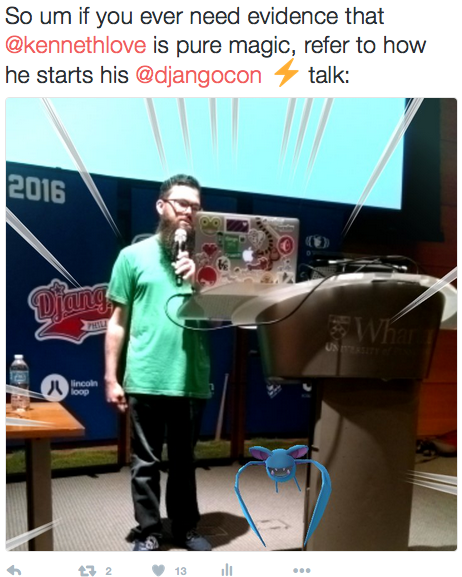 I also gave two lightning talks. 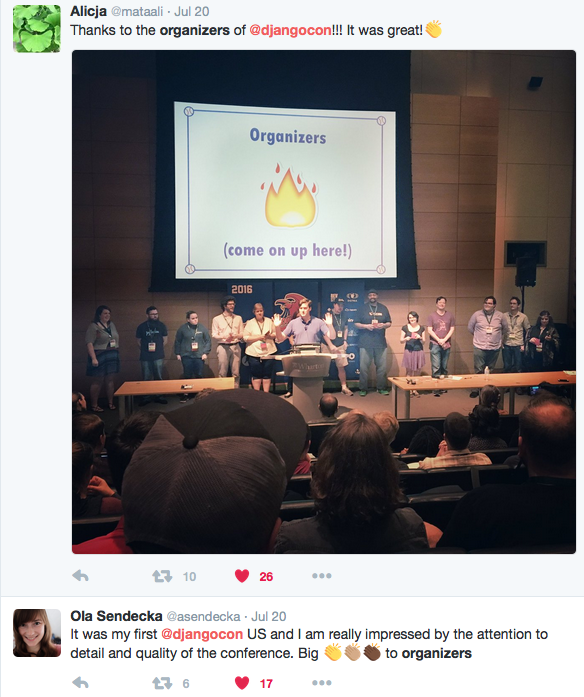 On Monday I kicked off lightning talks with an invitation to the community: rise to the challenge and meet an ambitious fundraising goal of $30,000 to Django Project by the end of sprints. I shared a bit about the work Tim and I do for Django Project and encouraged folks to speak with their teams about becoming corporate members. 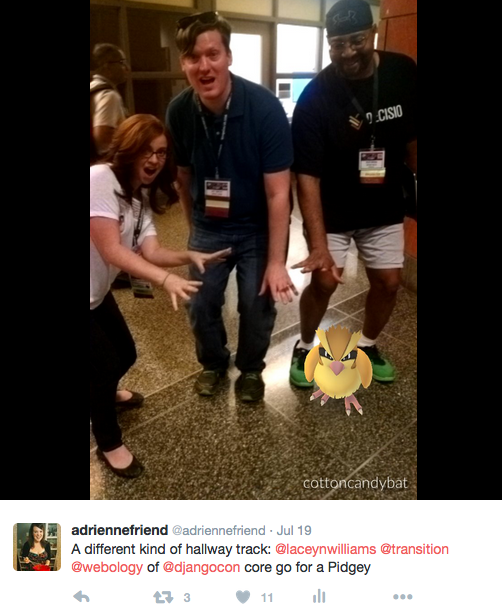 Full slides (and more Pokemon) from that talk here. I am thrilled to report that throughout the week we received $4,000 new dollars in corporate memberships, several solid leads for new corporate membership, $1000+ in private memberships, and we continued our JetBrains PyCharm partnership, which, when the final numbers are announced, will be big. I also gave a talk on Wednesday explaining the “Your Django Story” interview series for the Django Girls blog and inviting anyone who is a woman or knows a woman to tell their story for our blog. 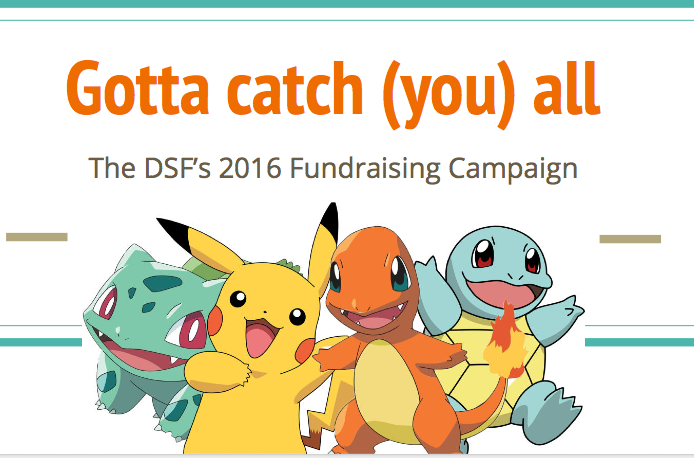 We still need folks! Slides for the Your Django Story talk here. 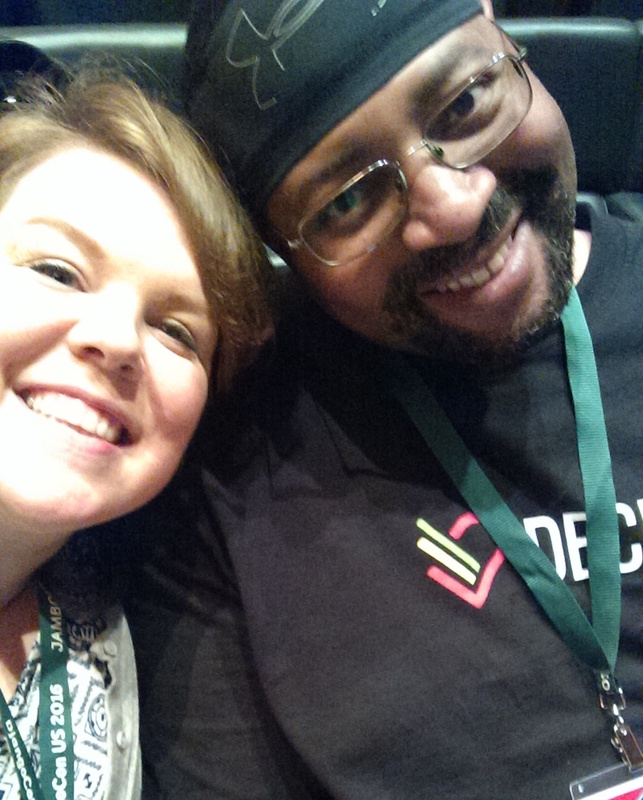 As co-chairs Lacey and Jeff humbly emphasized, DjangoCon was a team effort! Though I focused on updating docs, running sessions, and providing on-site support, I was proud to work with such a committed, dynamic, and kind group of folks to make it happen. 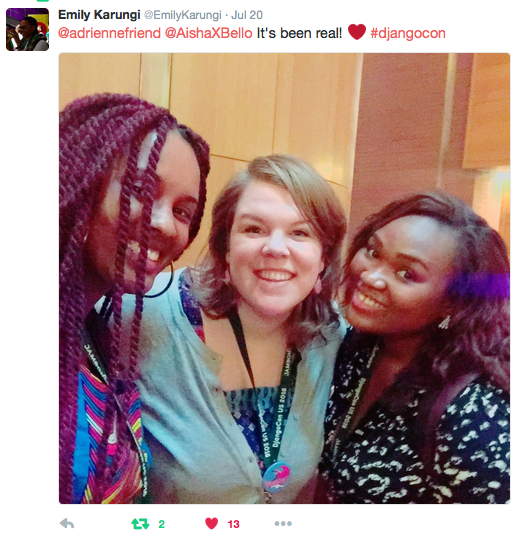 For more about the community, check out my pal Saron’s Medium post: “That time I went to DjangoCon and fell in love with the community“. Meeting folks for the first time! One of the great things about open source is that you get to work with people all over the world. You’ll email back and forth, build things together, occasionally Skype, but never have met in person. Until you do. And then, it’s magic. This year I was thrilled to get to meet some folks for the first time, including Aisha, Ibrahim, Emily Karungi, and Tom Christie! I also got to spend some quality time with my dear friend Žan, who mentored me on my first real open-source project AND brought me beautiful pumpkin seed oil from Slovenia! Baptiste, Ola Sendecka, Ola Sitarska, Lucie, Erik and so many others were also in town… it was a party. 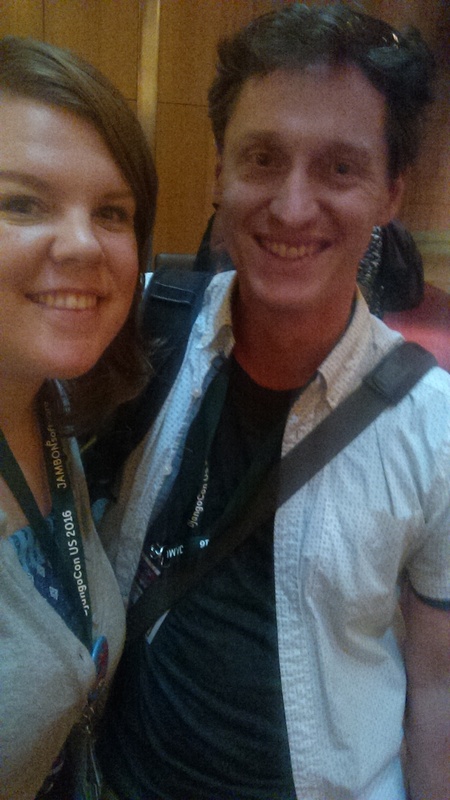 Big special thanks to co-organizer Tim Allen, who not only ran the heck out of the conference and gave an amazing talk, but also hosted me in his home. I couldn’t have done it without you, Tim! 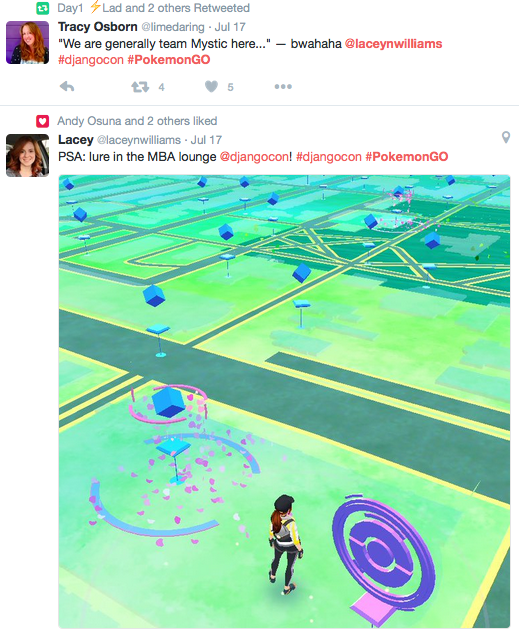 It just so happened that DjangoCon coincided with the intense cultural phenomenon called PokemonGo. Ahem, what we were talking about?